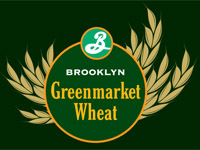 GrowNYC and Brooklyn Brewery are excited to announce the launch of Greenmarket Wheat, a beer collaboration between local farmers, malters, and brewers that captures the flavor of regional agriculture in a bottle. Greenmarket Wheat is a wheat beer made with raw wheat from North Country Farm in Watertown, NY, Pilsner Barley Malt from Valley Malt in Hadley, MA, and Wildflower Honey from Tremblay Apiaries, Chemung County, NY. The idea for Greenmarket Wheat grew from New York State Governor Andrew Cuomo’s 2012 Farm Brewery License legislation aimed at expanding the growth of craft breweries and increase demand for locally grown products to brew beer statewide. "Our Greenmarket Regional Grains Initiative works with regional farmers to devote more acreage to growing grains. Creating partnerships to move their product into the hands of bakers—and now brewers—has helped their businesses scale up production," said Marcel Van Ooyen, executive director of GrowNYC. "Greenmarket Wheat is a collaboration of local growers, millers, malters and brewers who will all benefit from the sale of this new product, not to mention consumers who can purchase a refreshing ale they can feel good supporting. Shoppers come to the Greenmarket to eat local. Now they can drink local. We couldn’t be more thrilled to work with Brooklyn Brewery and our producers to bring local grains into the spotlight." Greenmarket Wheat will be available for sale by the bottle on Wednesdays and Saturdays at Union Square Greenmarket. Did you know that GrowNYC's Greenmarket program had a weekly radio show? Tune in each Thursday at 1:45 PM to Heritage Radio for the GrowNYC Market Update to hear profiles of our 50+ markets around the city-- including tips like which farmers have the first snap peas, historical and cultural sites near the farmstands and where to grab a special snack in the neighborhood. Or catch up on past radio shows below!